QHDC exhibited at the Asia –Pacific International Mining Exhibition held at Sydney Showground from 29 – 31 August. Our team of Roy, Shane and Grant report a lot of interest was shown by visitors and fellow exhibitors in the Blickle range of wheels and castors. On display was a sample “trolley” featuring the new Hydraulic Lifting Castor system from Blickle, which became a talking point. Each set consists of a hand wind hydraulic pump and 4 castors that lift and lower simultaneously, capable of moving and lifting a load of 750kg in total. For uneven floors each foot can be adjusted manually. 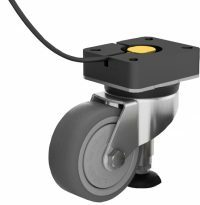 Lifting castors are ideal for moving/installing machinery that requires to be moveable and yet stable. As the castor is lifted a pad is lowered to the floor so that the machine cannot move. When it is time to reposition or maintain/clean the castor can be lowered for easy rolling. 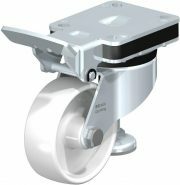 These hydraulic ones are special build and not a stocked item but if you want more information or prices on the range of Blickle levelling castors, including manually operated ones please speak with our sales team on (07) 5582 0000, or visit www.Blickle.com.